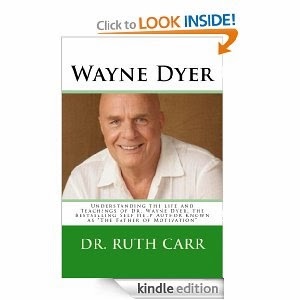 "Wayne Dyer," by Dr. Ruth Carr, is a book about Dr. Wayne Dyers's teachings on self-improvement. The book covers everything from discovering your purpose to how to remain humble. The author, Dr. Ruth Carr, a clinical psychologist and counselor, did an excellent job of writing a book that captures both Dyer's life story and teachings. Dyer (nicknamed The Father of Motivation) has had a singular quest to help people improve their lives, and this book is organized around that goal. The book begins with a background on Dyer's life, starting with his time in orphanages. The rest of the book is based primarily on Dyer's teachings, but does include some information about his life, such as the details of his trips to the East. Carr does an excellent job of distlling Dyer's teachings into easy-to-understand chapters. The book is organized in short chapters that each cover a topic, so the information is both comprehensive yet succinct. Much of the teachings have to do with learning to accept yourself and then deciding how to improve yourself. Overall, if you are looking for a book about how to become a better person through self-assessment and spirituality, then this book is for you.